Group of atleast 4 people is required for this trek. Transport from Srinagar to Aru Base and from Sumbal to Srinagar can be arranged for around Rs. 2000 per vehicle per side depending on the season. An additional 1-D/N stay can be arranged at the start of the trek at Aru valley, it will cost you extra amount of 1500 INR per person. 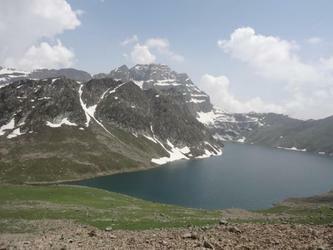 The Tarsar Marsar Lake trek gives you the memorable glimpse of the breath-taking beauty of Kashmir. In just 3 to 4 days depending upon your itinerary, you get to experience its scenic meadows, pristine almond shape lakes and beautiful valleys - that are so well known throughout the world. Pahalgam is a small town in the Ananthnag district of Kashmir located on the banks of the Lidder River. It is a well known tourist destination. Just 14 km from Pahalgam is a place called Aru. The drive to Aru has a beautiful view of the Pahalgam valley covered with pine trees. Aru, also called mini Switzerland, is a tiny village amidst the Himalayan forests and wildlife. Quite a number of treks begin in this region - the most famous ones being the treks to Tarsar and Marsar lakes, Kolahai glacier, Lidderwat and Katrinag valley. There are many camping sites at the meadows of Aru through which a small stream runs. If you prefer a more comfortable stay before the start of the Tarsar Marsar trek then there are few cottages and guest houses available as well. Day 1: Aru Valley to Lidderwat. Day 2: Lidderwat Valley to Seikiwais. Day 3: Seikiwais to Tarsar Lake. Day 4: Tarsar Lake to Marsar Lake. Day 5: Tarsar to Sonamous. Day 6: Sonamous to Sumbal Village. We will proceed from the Aru Valley on foot along a trail that follows alongside the Lidder River and opens into the lush green meadows of the Lidderwat Valley. It is an excellent campsite for overnight camping. We can even set up a campfire in the later hours of the evening. Day 3rd Lidder Valley steep climb one involving a lot of ascending. We first head to Hamwais, where we will cross the river. While crossing, we will battle another steep ascent to reach Seikiwais – a beautiful meadow base-camp. The track has numerous clear streams providing drinking water. The Seikiwais is one of the best campsites of the entire trek. Here we will have a relaxed night after the long, stressful climb. A steep walk alongside the Tarsar Lake will lead you to the Marsar Lake. Here we will enjoy watching the nature and listening to the melodious chirping of birds. 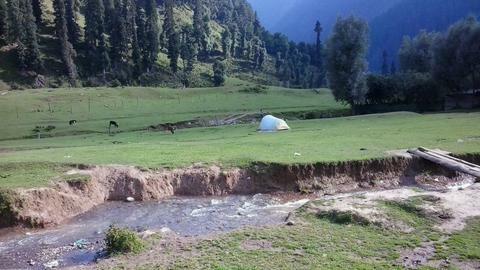 After taking a dip in the fresh water, we will head back to the Tarsar Campsite. Camping alongside this lake is a beautiful experience..
On our last day of the trip, we will head out from Sonamous and move toward Sumbal, where a steep six-hour descent will bring us into the midst of the mesmerizing Sumbal village. This is where Tasrsar Marsar trek ends.